General Project’s experience and know how led to the development of an innovative diode for advanced hair removal with dual handpiece: 808 nm and 760 nm wavelength. Thanks to the gold standard diode technology and user-friendly handpiece, laser hair removal is now more effective, fast and comfortable for all skin type including dark skin. The high melanin absorption of alexandrite 760nm wavelength combined with aggressive contact cooling make GP Fast an ideal solution for the hair removal especially for light colored and fine hair. Dual handpiece of 808nm and 760 nm wavelength make the GP Fast the most effective and complete solution for hair removal. How GP Fast benefits your practice? Upgradable with 760 nm wavelength. Handpiece guarantee of 10.000.000 shots. 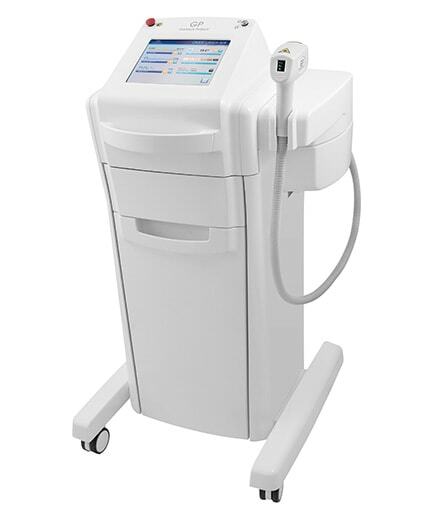 This high speed hair removal system delivers 12 impulse per second which rapidly scan the target. Offer both the possibility to use pre-set programs or to run it manually. The display integrated on the handpiece allows easy selection of the parameters and continuous monitoring of the treatment. How GP Fast benefits your patient? Safe and effective on all skin types (Fitzpatrick I-VI). Its advanced cooling system helps to protect the epidermis and makes the treatment more safe and comfortable for the patient. Faster treatments save time, ease scheduling. What can you treat with GP Fast? Request a Demo! Faq Get More Info ! What is the Med 2 Contour Procedure?